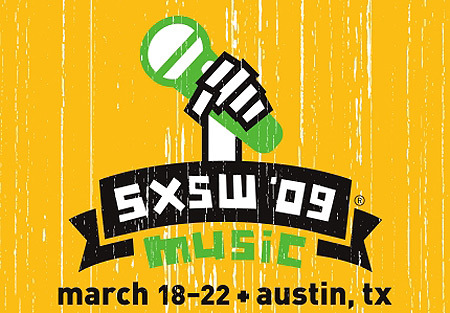 Perhaps I’m jaded these days, but out of the 30+ bands I saw this year at SxSW, only one truly astounded me. HEALTH, Constantines, and Anavan won my heart last year, but this year, my heart goes solely to Madrid’s Hyperpotamus, brought to SxSW by SonicBids. Nonetheless, there were definitely other enjoyable acts – albeit not mind-blowing – but here are my five favorite acts of the year. Madrid’s Hyperpotamus describes himself and his music as a “solo a capella show,” but I must admit that the terminology initially meant nothing to me. It is a simple yet clever description, but it’s almost too simple. After seeing Hyperpotamus perform, you begin to realize that he is in fact a “solo a capella choir and band in one.” He makes the beats, the operatic background vocals, the tender harmonies, and the turntable scratches all with his mouth, four microphones, and a loop station. Sounds are looped over and over one another to create complete, dynamic songs that range from R&B ballads to hip-hop tracks and electronic jams. Armed with what must be a freakishly multi-track mind capable of processing an impeccable sense of rhythm, Hyperpotamus creates all of his music in real time and improvises a huge amount. Prior to the show, I asked him which three songs he was going to start off with, and he told me that he had no idea. Quite surprisingly, he only made one mistake during the duration of his hour-long set. During his set, Hyperpotamus transformed from the rather humble-seeming man before the show into an absolute goofball. It became very obvious that he is extremely comfortable on stage, and his stage antics captured the attention of every passerbyer in the Hilton lounge where he was performing. Even those who did not stay to watch could not stop watching as they were walking away – even as they were ascending the escalator or working at the hotel – and Hyperpotamus drew in a crowd that grew more than four times from what it was initially. Scissors For Lefty have been on REDEFINE’s radar off and on for the past four years, but this SxSW was the first time I’ve ever caught them live. Despite having one keyboardist missing due to his child being born, Scissors For Lefty made the best of their situation one particularly rowdy, packed night on the Wave Rooftop. They played their synths via an iPod to make up for the lack of their fifth member, but still managed to deliver an energetic show when all was said and done. Scissors For Lefty is a band that can be greatly praised when one takes into account how their sound differs between their live incarnations and their recorded incarnations. Lead vocalist Bryan Garza might sound more pleasing to the ears in their recorded works, but he is much more charismatic in person, and he has a showman’s mentality. He’s open to freestyle antics and has a particular indie rock performer quality found perhaps in the frontmen of other dance bands like Hot Hot Heat or Franz Ferdinand. With the whole band decked out in flashy clothing and illuminated by fog machines and neon lights, Scissors For Lefty worked hard on this spring evening to make damn sure the crowd danced to their music, by jiving, screaming, and shimmying themselves. Those well-versed in electronic music might be familiar with UK-based producer and DJ, Adam Freeland. This SxSW, Adam Freeland mixed up his performances between DJ sets and sets played with a live band. The live band project, uncreatively dubbed Freeland, turned Adam Freeland’s electronic music into rock music — which was an appropriate thing to test-drive on the generally rock-minded SxSW crowd. Comprised of three men armed nearly head to toe with miscellaneous technical equipment, Freeland played fan favorites like the deep, synthesized-voice driven “We Want Your Soul” and ended with a ridiculous ditty sung by Adam Freeland himself about the virtues of female vaginas. The set managed to offer satisfaction to those who knew the music well and also fed the curiosity of those who didn’t know it at all, creating a mass of midnight show-goers ready to dance. In Boston, The Everyday Visuals garnered a reputation as a great live band, including the title of “Best Live Act” from one of their local papers, The Improper Bostonian. It’s a difficult feat to accomplish, particularly in a large city where many bands exist, but with a SxSW-sanctioned write-up under their belt, TEV played a night at Habana Calle 6 to a newly engaged audience. By harmonizing during tender moments and rocking out during raucous moments, TEV charmed the crowd with their ability to showcase a wide array of styles. Playing mostly new songs, a couple of old discs, and an energetic cover of the Beach Boys’ “Sloop John B,” TEV showed off the fact that they are a talented band with multiple members capable of singing well and capable of playing multiple instruments. Although their set started off a bit rough and perhaps even slightly boring, The Everyday Visuals soon brought their unique brand of folky, poppy indie rock to life for a room full of passerbyers and new fans to enjoy. Port O’ Brien is a band that I had heard about and somewhat enjoyed, but I’d never cared enough to acquire their music myself. When they took the stage at Red Eyed Fly one sunny afternoon, however, they were spurred on by two drunken Seattlites who were sitting front and center, loudly telling the band and the audience how stoked they were to see Port O’ Brien at SxSW since they had missed them the last time the band had gone to Seattle. The members of Port O’ Brien took the harassment graciously, humoring the drunken dudes and engaging them in conversation. It was then that it became obvious to me that a Port O’ Brien show is one that not only features good music, but ultimately, good vibes. Among the lead vocalist’s raw, Kurt Cobain-esque tone of voice, the guitarist’s wildly stomping dance moves, and the bassist’s calm demeanor, the guys of Port O’ Brien showed diverse sides of themselves that ensured good fun for the whole family. They finished off their set by offering old pots, pans, and miscellaneous metal objects for crowdgoers to bang on while they performed what is probably their most favorite song, “I Woke Up Today.” The result was a wholly engaged crowd and a SxSW finale that ended with an enormous amount of positive energy and the sense of community rivaled by any great street performance.